The pro version of the software product CAESES® can be licensed in a few configurations. Based on a powerful standard edition, you can add further functionality according to your application and industry (see the add-on section below). The standard edition is the main product which contains the all general CAD capabilities, CFD coupling as well as strategies for automated design studies and optimization. Free form deformations are already included for shape optimization of existing geometries (e.g. from STL or IGES data). Prices on request. * Note that the SHIPFLOW interface is not included in the standard edition. For the design and optimization of any rotating machinery there is the add-on Turbo which gives you parametric blade design capabilities. In particular, specialized curve and surface types map user-defined 2D sections into the 3D space. The Maritime add-on is dedicated to naval architects and maritime CFD experts that want to design and optimize ship hulls. Besides the functionality from the standard edition, advanced shift transformations for ship hulls (see this post) and the hydrostatic calculation are provided. See also the marine section for more information. This is an extension to the standard edition which adds advanced optimization capabilities to CAESES®. As a highlight, the optimization toolkit Dakota is fully integrated, to let you readily use the entire Dakota method set (e.g. response surfaces, more sampling and optimization methods). More information about optimization functionality can be found here. Included is also an optional SSH Resource Manager which is a separate piece of software (click here for an illustration). 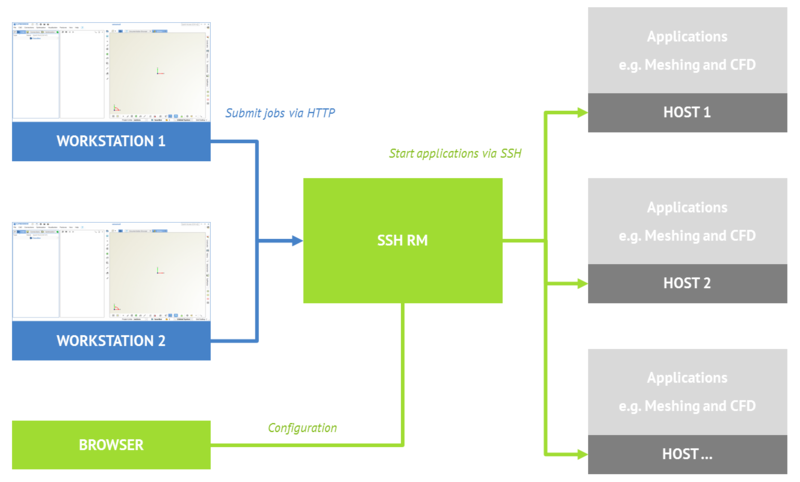 The SSH Resource Manager is a light weight grid engine designed to enable CAESES® to start external simulations on remote computers based on the SSH protocol – with a single button-click, directly from within the CAESES® GUI. Using the SSH Resource Manager behaves the same as if the simulation was executed on the local machine. This grid engine is a platform-independent program that can run on any operating system for which Java is available. It allows to reduce the idle time of software licenses and to utilize available hardware resources fully. Additionally, it enables CAESES® to pass operating system boundaries, when, for example, the software you want to integrate has to run on a certain operating system but your CAESES® users work on a different operating system. On top of the standard edition, this package gives you advanced optimization capabilities PLUS the maritime add-on (for advanced ship hull optimization) OR the turbo edition capabilities (for advanced blade design of any type of blade shape). In addition to the commercial editions, there are academic teaching licenses (ATL), and academic research licenses (ARL) for funded research. If needed, you can order float licenses for the ATL/ARL, to install CAESES® on a server and give PC-independent access to it. Intended for hands-on teaching in a classroom environment. It also includes maintenance and premium support. Intended for academic R&D projects. The academic research license can be combined with an academic teaching license (conditions may apply). It also includes maintenance and premium support. FRIENDSHIP SYSTEMS supports students! Hence, there is an offer for non-commercial academic edition for students and PhD candidates for free (limitations may apply). Student licenses currently comprise the entire functionality of CAESES® without any limitations. The license is strictly intended for personal use and self-learning and may not be used for funded projects or University sponsored R&D programs. CAESES® must be installed on a personal PC/notebook rather than on University computers. Download and install CAESES® from our download area. During the registration process, choose “Free Student License” and follow the instructions. Your certificate of enrollment displaying a date and period for verification (PDF or image) is needed. After we have received your certificate, we will examine your request details. It is possible that you will be contacted by FRIENDSHIP SYSTEMS or a local sales partner for further information. Free student licenses are granted at the sole discretion of FRIENDSHIP SYSTEMS. This offer may not be available in all countries or may be withdrawn without any prior notice. As soon as your certificate expires, just send us a copy of the new one using this email address (include your license ID in the subject line), and we will extend it again. By granting you this free license we expect you to send us a summary report of the work that you have accomplished with CAESES® or a PDF copy of your thesis if applicable. For help and support with CAESES®, please visit the forum. Finally, we offer special batch mode licenses if you want to use CAESES® as a geometry engine in combination with your optimization tool of choice. This allows you to run up to several hundreds CAESES® instances at the same time, e.g. for creating geometry variants on HPC clusters. More information can be found here. Are you interested in receiving a quote? Or do you have any further questions? Then don’t hesitate to drop us a line. We look forward to getting in touch with you!